Torrents – Shortly after I got my satellite connection, I made the mistake of trying to get a DVD image of a Linux build over torrent. After all, I’ve got a slow Internet connection, so torrents seemed like the perfect solution. I could start and stop the download, I could let it go while I was away from the house, etc. What I didn’t realize was that, with the bandwidth limits imposed by my ISP, I’d be without an Internet connection for 30 days after my uploads exceeded the limit. My ISP (Wildblue) enforces a rolling 30-day limit on bandwidth (my package allows about 4 gigs of uploads in any 30-day period). It took about 2 days of being hooked up to a torrent before I had uploaded approximately 7 gigs of data. All of a sudden, my access speeds dropped below those of dial-up connections because I had violated the Fair Access Policy. VOIP Calls – Because of the latency you will experience when using a satellite connection (approximately 1.5 seconds), trying to use a VOIP (voice-over Internet protocol) phone call is completely pointless. You’ll end up talking over-top of the person on the other end, and you won’t hear each other until about 2 to 3 seconds after you’ve spoken. Streaming Video – While you can safely watch short videos from sites like YouTube, trying to watch full-length videos on sites like Hulu and CBS.com is basically out of the question. As I’ve mentioned once or twice before, the protocol used on those types of sites causes the video to stop and buffer for one to five minutes basically every minute or two. 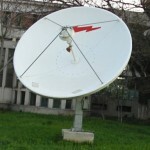 Surf While It’s Storming – Unfortunately, the satellite dish is dependent on “line-of-sight.” When there are clouds in the sky, you lose your Internet connection. When it comes back is anyone’s guess. Sometimes, it only goes out for a few minutes. Other times, it’s gone for a hours on end. Virtual Private Networking/Remote Desktop Connections – If you use a VPN, or, even worse, a remote desktop connection to work on office stuff while you’re at home, you can forget about that when you get a satellite connection. VPNs are possible, but they’ll be dreadfully slow. Remote desktop connections are completely out of the question (unless you want to emulate the feeling of trying to run Windows Vista on a 286). So, there you have it. Those are five things you can leave off or your to-do list once you move out of range from mainstream broadband services. Good luck.